Uttar Pradesh Subordinate Services Selection Commission (UPSSSC) had released yet another bharti notification. This time, it had issued a job notification for filling the vacancies of 465 Rajasva Nirikshak (Revenue Inspector) posts under Rajasva Nirikshak (Samanya Chayan) Pariksha 2016. Those who got selected for these posts will get pay scale of 5200-20200 GP 2800. 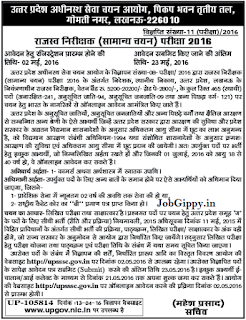 Interested and Eligible candidates can apply online from 02-05-2016 to 23-05-2016 at upsssc.gov.in. Other details like Eligibility criteria, age limit, qualification, selection process, fee are given below. Age factor: Candidates age limit should between 18 to 40 years as on 01-07-2016. Age relaxation is applicable. Required Educational Qualification: Candidates should have passed bachelor degree in Commerce or Economics. 2 years service in Army. Selection Process: Candidates will be selected based on their performance in written examination and interview. Candidates can fill online application forms at upsssc.gov.in from 02-05-2016 to 23-05-2016. Starting Date to Apply Online: 02-05-2016. 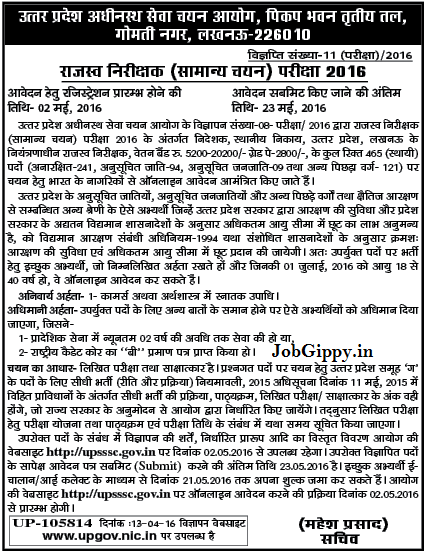 For more details, download the UP Rajasva Nirikshak notification from below.